Alright, the last time I paid $12.00 for a bowl of noodles, I felt a bit ripped off. Yes, if you guessed Chef Hung at Aberdeen Centre, you are correct. At the very least, I didn't have to lineup and honestly, the noodles were not bad. But certainly not worth the money I paid. Of course, when you're paying over $10.00 for a bowl of anything, one would expect quality over quantity. Once again, I was faced with paying $12.00 for a bowl of noodles. 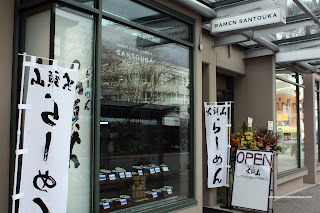 Creating much fanfare, the newest entry to the ramen scene in Vancouver is Hakkaido Ramen Santouka. Part of a much bigger chain of restaurants originating from Japan, there is much excitement and anticipation amongst ramen lovers in the GVRD. Located in the triangle of ramen down on Robson near Denman (Benkei, Kintaro and Motomachi Shokudo), it's the ultimate noodle showdown in one place. Santouka had been open for a little while already during their "soft launch". I decided to visit it on the grand opening date of March 5, 2010; but there was a substantial lineup. You see, lineups and I go together like Conan O'Brien and NBC. We ended up going to Guu Garden instead. Undeterred, when I heard that Kim was going to visit it for a 2nd time on the following Monday, I decided to see if he would like a dining partner. As always, he's game for that and we met up slightly before noon. Lucky for us, not too long after we sat down, a relatively long line began to queue up. Kim encouraged me to get the Toroniku Shio Ramen which includes pork cheek and toppings served separately from the noodles. I added an Ajitama Egg for good measure. Kim went for a set lunch which included choice of ramen broth (in this case Shoyu), fully cooked egg and a Cha Shu Gohan. A short wait and our food arrived on 2 plastic platters. At first glance, there doesn't seem to be a lot of food for $12.00. But it is deceiving. There is a decent amount of noodles hidden in the broth. And about that broth... Immediately, before I even took a spoonful, I could tell it was nice. The cloudy colour, the hint of pork fat and the "thickness" of the broth indicated slow and meticulous cooking with rendered fat and bone marrow. One sip and it was obvious that the shio broth was indeed very rich. 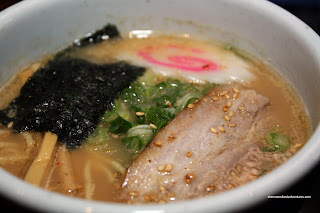 More sweet than salty, the broth was silky with rich meat/fat/marrow undertones. This is probably the best shio broth I've had so far in Vancouver. Although, I must reiterate that I still like Kintaro despite this. The reason is that they are not exactly alike and are good in their own way. But I must concede that the food here is much more refined than Kintaro. The noodles were on the softer side of al dente, which was fine by me. But I have to say that the deliciousness didn't end there. The pork cheek was absolutely divine. Being that it was pork cheek, the meat had a slight resistance in a gelatinous way. However, once past that initial chewiness (which is a good thing), it was very tender with a nice rich pork flavour. 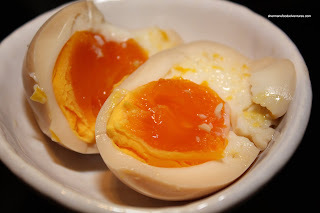 As for the Ajitama Egg, this is a picture of it on the second visit. Yes, I actually visited the place again the very next day! I wanted Viv to try and we paid $12.00 for a bowl of ramen again! Good thing too, in my haste on my first visit, I took a bite before taking a picture of it. The shame... Anyways, it was perfect. If not for high cholesterol, I'd have a dozen of these. As for Kim's Shoyu Ramen, the broth was predictably lighter and since it has soy in it, a tad saltier. His Cha Shu Gohan was delicious. The slow-cooked pork had a "roasted" quality to it (even though its not roasted) and literally melted in my mouth. 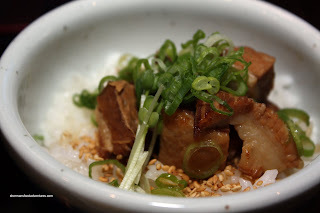 The rice had a nice consistency and the whole thing wasn't overseasoned so that the pork could do its thing. Honestly, this was a very satisfying meal. I knew I liked it since I wanted to have more of it and had thoughts of coming back once finished. And as mentioned, I did in fact return - the very next day! I got Viv to try the Shio Ramen and she thought it was very good. Her thoughts were that the pork cheek was a bit over seasoned, bordering on salty. I could see that; but it didn't bother me as much. 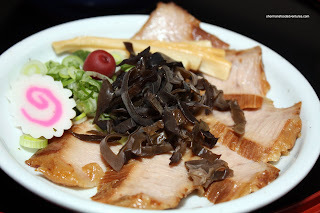 I was lucky to try a previously unavailable product, which was the Tsuke Men. It's essentially a pile of cold ramen (apparently double the amount than a soup version) accompanied by a shoyu "dipping" broth with fatty pork and a fully cooked egg. 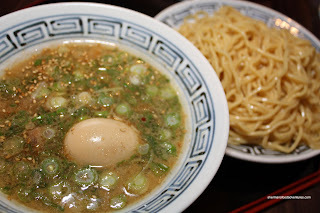 The broth itself was quite fatty and salty; but it worked with the cold al dente noodles. The fatty pork hidden within the broth was delicious. Exhibiting the same "roasted" rich taste as the gohan, I only wished there was more than one piece and a couple of chunks. I originally asked for the spicy version; however, I think they messed up and gave me the regular one instead. Whatever the case, it was good; but nothing really all that special in the grand scheme of things. I'd stick with the Shio Ramen as the go-to meal here. You know what? I wanted to dislike this place because $12.00 is a whole lot of money for a bowl of noodles. However, unlike Chef Hung, these noodles were not just good, they were excellent. I have to admit that it was worth the price and I would gladly pay it again (which I did). Hey, even Kim likes it and since he hates everything, that means a lot. I do not hate everything. I mean, I like Mijune; I like Anita; I like you (Errrrrr, I will stop there, that might have sounded strange). If I hated you, I might have well tried to spike your food that day! Anyway, agreed, it was indeed good but, the more people have gone, interestingly, I have heard people prefering Kintaro for diverse reasons, with $$$, portion size and, oddly, richness, the main reasons. 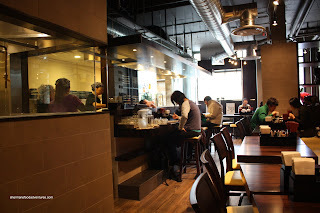 So, for completeness, next time your are in Downtown, Motomachi Shokudo? LOL Kim... err... thanks??? Anyways, you're right about the cost. It will get pretty expensive to go there all the time. It's one of those spluges once in awhile. I stll like Kintaro as well. I like both for their own reasons. For value for money, this place is terrible in my opinion. However, if money isn't considered, the Ramen is still quite good. I still favor Kintaro/Motomachi Shukudo over this place, although the decor of this place is rather pleasant. Jenny, we just give Kim a hard time! Brian, I don't disagree with you there. The more I think about the cost, the more not worth it is. I can't take away that it's good though. However, the other items I've tried so far are average. So the Shio Ramen is the only thing special about the place. But a $12, I'm not sure how many people will go for that. BTW, I did not like G-Men either. @Brian, just as Sherman mentioned, if I would go back, it would be most certainly for the toroniku. The other ones didn't really wow me. ok, stupid question: in your picture of the toppings, what is that white thing with the pink swirl? i've seen it in udon as well and i still don't know what it is... ? Not like Jenny? Geez... LOL... Yah, I wasn't all that impressed with G-Men either. Hi Trisha, there are no stupid questions... Anyways, it's a fish cake (fish mousse to be exact), formed, coloured, then cut. shokutsu, it was refreshing. Too bad there wasn't much substance to it (not enough meat). 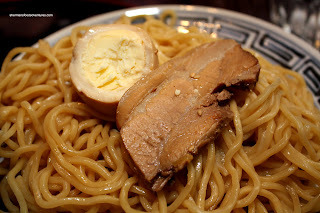 Ah, but that's the key to a good tsukemen, its all about the broth. I got one for you Sherman; I have never had ramen in a restaurant but really want to try it. 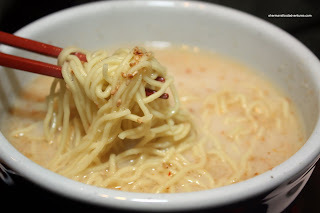 I've only had instant ramen (yes i know I'm sad but my friends introduced it to me last year during a really bad spell and I'm addicted) and i was wondering where would be the best place in the lower mainland to take my first dip into real ramen. Brad, I would suggest Kintaro, but if u want more soup choices, I'd go for Benkei. I read other bloggers today on santouka,everything is still good. but the egg is fully cooked:(. not as yummy as what u got ..